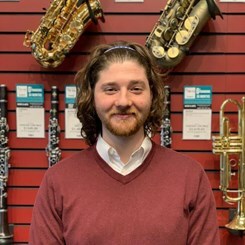 Hello, my name is Benjamin Manganiello, and I am an eager young sales associate excited to be a member of the Music & Arts team. My Bachelor of Arts in Music Business from the Crane School of Music and my Associates Degree in Music from Onondaga Community College helped to prepare me for this opportunity. My musical tastes range from classic rock to classical music (and everything in between!). As a woodwind player, I began by learning clarinet, then moving to the saxophones, and now I mostly play bass clarinet. In fact, due to my experience playing bass, alto, and contrabass clarinets I consider myself an auxiliary clarinetist. I am a novice keyboard/piano player, and due to recent interest in pro audio/live music, I am now an electric bass player. I began working here in May 2018, after a year of experience in retail. During this time I also participated in an internship with SubCat recording studios, working alongside the full-time audio engineers and assisting the studio manager with daily responsibilities. In addition, I also worked on projects with a local events promoter, John Pettigrass (AEM). As a graduate of Liverpool Highschool, I am proud to back in my hometown shaping the local band and orchestra programs!